this is the first art installation that i have done outside of hong kong. it is located on a beautiful beach in kenting national park on the southern tip of taiwan. 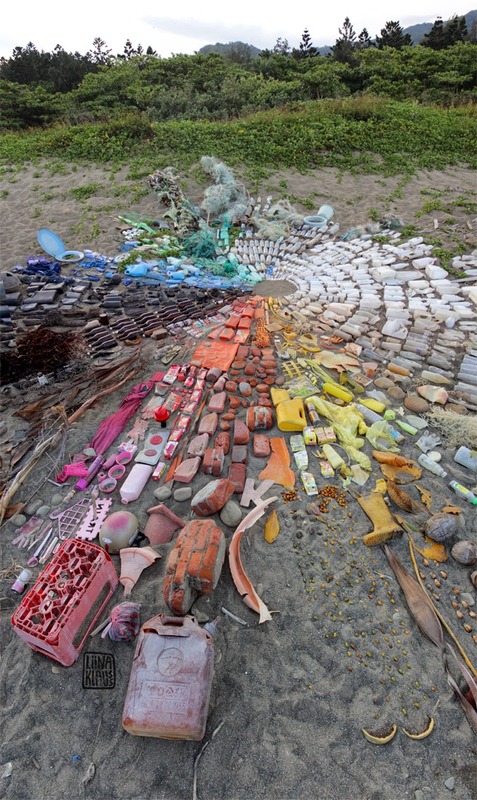 when i inspected the beach prior to the art installation, i was doubting we'd find enough man-made waste to fill up the whole colour spectrum. sadly enough we did. with the help of over 30 passionate art activists, we painted an area of about 10 square meters with all colours of the rainbow: fishing nets, single-use plastic bottles, boots, shades, straws, a toilet seat... the list is infinite. most of the trash was trapped within rocks and vegetation and not visible on first sight. compared to hong kong there is definitely less trash per square meter on this beach, yet the findings are almost identical: predominantly light-weight plastic. often i get asked 'what can i do?' and i say 'start with yourself!' in this colour-wheel like in so many other installations that i've done, the single-use water bottles take up almost a fifth of the space. we can eliminate these convenient yet all-polluting PET bottles: bring your own! it might be a tiny action, but if a couple of million people all do the same, it has a huge impact (as we can see in its negative!!). in the face of so many horrifying facts, i am yet again grateful to meet amazing people who want to help and be part of the solution. to each and everyone who came on that hot day, picking up trash, sorting, sweating, abandoning the surf-board (how hard is that! ), playing, taking pictures, and even using the installation for a bonfire: this is not possible without you! you are the ones who spread the message further! my heartfelt gratitude to you. thank you. i want to especially thank claire from bossa-nova-beach-cafe for organizing this event: you are not only an excellent cook but also an extremely talented event manager! thanks also to la benida for her enthusiasm, help and hospitality: we felt like part of the family! a big thank you also to society of wilderness (www.sow.org.tw), kenting national park (www.ktnp.gov.tw), kuroshio ocean foundation (www.kuroshio.org.tw) and environmental information association (www.e-info.org.tw) for their support.